Curing Families – a new way of looking at the prostate cancer problem. For years, scientists have been baffled about why the same cancer treatment might work for one patient, but not another. Thanks in part to research funded by the Prostate Cancer Foundation, all that is changing. Scientists are beginning to understand that each patient doesn’t just have prostate cancer, they have their own particular form of prostate cancer (29 forms, to be exact). New technologies that allow us to identify the gene mutations in a patient’s tumor have resulted in the emerging field of precision medicine, which takes into account individual variability in genes, immune function, environment, and lifestyle for each person. This means that cancer, even prostate cancer, is a family problem. We now know: some of the genes that are responsible for prostate cancer are also responsible for cancers in daughters, and vice versa; for example, if your mom has the BRCA gene for breast cancer, this increases your risk for prostate cancer. PCF is still doing what we’ve been doing for 25 years now: saving men’s lives. But a new era in cancer treatment is coming, and PCF-funded research for prostate cancer already has overlap in 67 other cancers. PCF believes that this new form of thinking – precision oncology that looks at cancer risk across your whole family – is the key to finally unlocking the mystery of curing all cancer. Getting your tumor sequenced could extend or save your life. Sequencing the DNA and RNA that is specific to the tumor cells in your biopsy could lead to treatment with the right medicine, for the right cancer, by giving your doctors a complete understanding of what’s making your tumor grow and divide. Of the top 5 major cancers, probably the most nutritionally studied is prostate cancer. Researchers are honing in on exactly how you should eat to reduce incidence and extend survival. For one thing, we can now strongly recommend that you get only 10% of your calories from fat. Another tip is to anchor your meals around eating beans, grains, and vegetables until your feel full. We also know that charred red meat is a true prostate cancer carcinogen. For the latest news and updates on nutrition, visit pcf.org. The US Preventative Task Force recently updated their guidelines to favor less screening in older men. The thinking is this: cancer is such a slow growing disease that too much screening could lead to over-treatment. 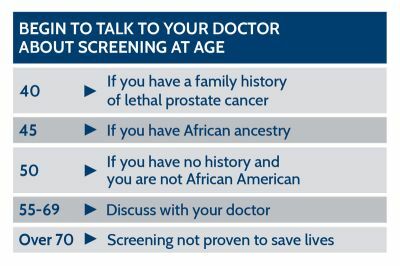 Your best approach is to practice precision screening, by using the following simple guidelines and talking with your doctor. Your germline refers to DNA genes that your inherited from your mother or father, that you will subsequently pass on to your children. There are about 60 genes across all cancers that are considered to be inheritable, and about 20 specific genes in prostate cancer families. Knowing your germline helps you understand the risk that you and your children face, so that you can create a precision family health plan for prevention and earlier detection. Because we now know so much about cancer’s hereditary properties, it’s absolutely critical that you share disease history with everyone in your family who shares the same germline (hereditary genes). Make it fun, discuss the latest breakthroughs in cancer research, and prepare a nutritional meal for everyone to share. It turns out, bodily inflammation in your 20s and 30s can cause the gene mutations that increase your risk of disease later in life. In fact, eating an anti-inflammatory diet is bio-chemically more anti-inflammatory than taking TWO aspirin. Basic guidelines for anti-inflammation include eating a basic whole-foods, Mediterranean diet with fish, free from processed food, saturated fat, dairy, and red meat.